This is the Book Cover, from the Safety Book of a long time ARTI member, Sadi Ghaderi. Published, in Iran during 2012. BECAUSE IT MEANS I AM EMPLOYED‏ . چون یعنی دوستان زیادی دارم که به فکر من هستند…SEND THIS TO SOMEONE YOU CARE ABOUT‏. این متن را برای کسی بفرستید که برای شما ارزش دارد. I believe as Sadi Ghaderi does, that ALL people should be saved by the’ triangle of life’. Just as we believe that no more people or children should die because of greedy insurance companies promoting ‘duck and cover’. ABSTRACT: Natural hazards have a devastating impact on the poorer section of society. The major factors influencing disaster risk are human and social vulnerability, combined with the overall capacity to respond or mitigate the impact of impending natural hazards. A challenge faced by developing and underdeveloped countries, while implementing disaster risk reduction (DRR) programmes is in establishing a linkage between poverty reduction programmes and provision for safe and secure living environment. The paper will try to review the relationship between poverty reduction programmes and DRR programmes in some of the developing and underdeveloped countries. The paper will also highlight the importance of the measures to bridge the gap between poverty reduction and DRR like rural development, infrastructure development, increasing awareness, training, cooperation between regional countries, funding organizations and international institutions as essential factors to reduce poverty and natural disasters risk. Data and information will be presented in form of photographs, carts, tables etc. Natural disasters are a fact of life for every country, but they are especially dangerous for people in countries where people struggle to survive. It is in these poorer, third-world countries that a major natural disaster can kill thousands and threaten the livelihoods of those who survive the disaster. Natural catastrophes cause sharp increases in poverty; what is uncertain is the extent of their long-term impact on the economic viability of developing nations. People who live in poverty are very vulnerable to natural disasters and no safety bets. For example, their houses are not made of the best quality materials. Poor people in poor countries do not have insurance to rebuild their homes after disasters. Their governments do not have the resources for disaster relief. Also Poor countries have limited or no resources to deal with the post-traumatic stress those survivors may face for decades to come, especially for parents who feel guilty that their children perished. About 95 percent of deaths caused by disasters occur in poor countries. A disaster of similar nature and size causes more deaths in poor countries than in rich ones. The World Bank estimates that more than 90 percent of the populations of Bangladesh, Nepal, the Dominican Republic, Burundi, Haiti, Taiwan, Malawi, El Salvador, and Honduras live in areas at high relative risk of death from two or more hazards. Poor governance, external sanctions, poverty, and foreign debt force peasants to burn wood and charcoal for fuel and to engage in unsustainable farming techniques which drive deforestation, the consequences of which are discussed below. This paper reviews and synthesizes the literature on poverty and natural disasters and discusses the role of poverty on impact of natural disasters. Therefore we studied the effects of natural disasters in poor developing countries in three decades latter. The main result of these researches shows that in each instance, the poor are the most deeply affected by the disaster and are more vulnerable to natural disasters, due to such factors as low national income, inadequate amount of education, skill, experience, health, work orientation, culture of poverty discrimination, place and type of residence, building construction, and social exclusion. the International Emergency Disasters Database (EMDAT) distinguishes two different types of disasters (natural and technological) divided into 15 main categories, covering more than 50 sub-categories. · Biological disasters: covering epidemics and insect infestations. · Nine of the top 10 countries with the highest number of disaster-related deaths were in Asia. · Since 1980, the World Bank has approved more than 500 operations related to disaster management, and between 1984 and 2009 the Bank has spent $52 billion in disaster-related projects. The Red Cross warns that the frequency and cost of natural disasters will probably increase due to: Environmental, degradation, Climate change, Population growth, especially in cities and Globalization. 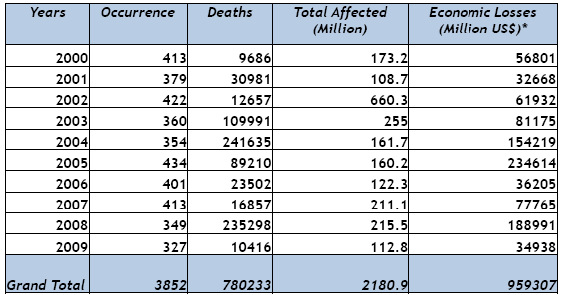 Between January 1975 and October 2008 and excluding epidemics, the International Emergency Disasters Database EMDAT recorded 8,866 events killing 2,283,767 people. Of these, 23 mega-disasters killed 1,786,084 people, mainly in developing countries. 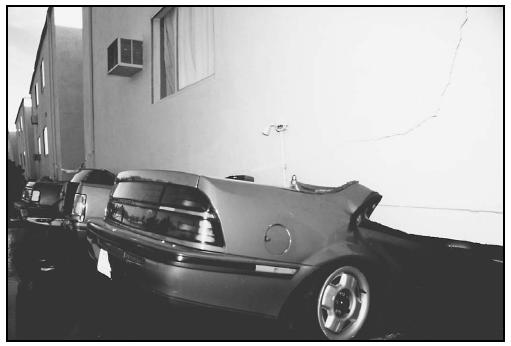 During the decade of the 1990’s, the number of catastrophes has increased five-fold, and the damages have increased by a factor of nine, contrasted to the decade of the 1960’s (Munich Re, 1999). During the decade of 1987-1997, the total direct economic loss from natural catastrophes was 700 billion USD, for an average loss of 70 billion USD. table 1: Natural disasters for the decade: 2000-2009. The annual average death toll for the 2000 decade was 78,000, which is considerably higher than the 43,000 of the previous decade (1990s). But in the 1980s, the annual average of persons killed was almost as high with 75,000 owing to two major droughts and famines in Ethiopia and Sudan. The average number of natural hazard events per annum in 2000-2009 was 385 compared to the annual average of 258 for the decade 1990-1999 and 165 for the decade 1980-1989. 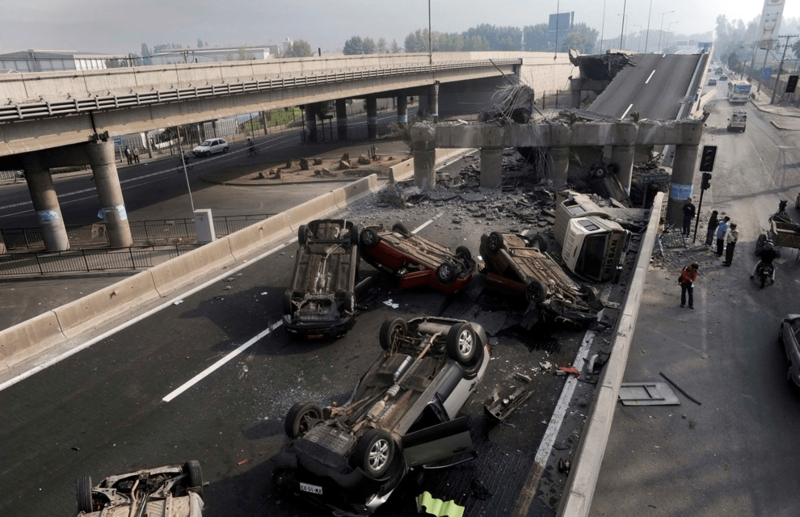 Earthquakes are the deadliest natural hazard of the past ten years and remain a serious threat for millions of people worldwide as eight out of the ten most populous cities in the world are on earthquake fault-lines. In the past decade, nearly 60 percent of the people killed by disasters died because of Earthquakes. After earthquakes, storms (22%) and extreme temperatures (11%) were the most deadly disasters between 2000 and 2009. Fig. 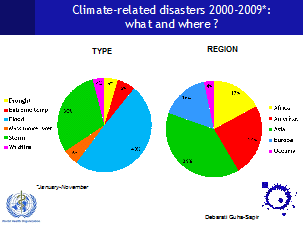 2: Type of disasters and region are effected(2000-2009). Many poor people, especially in developing countries, depend on natural resources for their social and economic wellbeing. These are commonly the rural population, and their poverty may be defined from different aspects. Resources such as agriculture, water, fisheries, or forestry generate income or secure livelihoods to the poor. If these resources deteriorate through pollution or overuse, the benefits for the poor decrease. Droughts and other climatic hazards have the potential to disrupt people’s lives, leading to losses of income, assets and opportunities. In 1998, 90% of the victims of natural disasters lived in LDCs; over half of Inter-American Development Bank (IDB) borrowers are exposed to natural disasters on a recurring basis, and there is a high statistical correlation between Gross Domestic Product (GDP) growth and the annual number of so-called “natural” disasters. Disaster risk is also concentrated in Asia where the poor are concentrated on the most marginal lands vulnerable to drought, flood, and other natural hazards. And the poor, through ignorance and desperation, can contribute to their own downfall by deforesting hillsides or over –cultivating farmland. This leads to new cycles of flood, drought or landslides. At least 900 million people now live in informal settlements in developing country cities. Many of these are in hazard prone areas. Urban hazards, such as flooding, are exacerbated by lack of investment in infrastructure. Poor people suffer worst from natural disasters. In rich countries, the average number of deaths per disaster is 23, while in the poorest the average is 1,052. 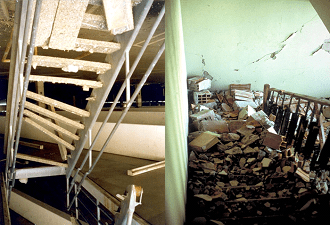 When the Hanshin earthquake struck Japan in 1995, it claimed the lives of some 6,000 people. But in 2005, the Kashmir earthquake in Pakistan, measuring about the same on the Richter scale, claimed 75,000 lives – 12 times as many – despite the fact that the earthquake affected areas with much lower levels of population density. Compare the Impacts of Natural Disasters shows that in poor and developing countriesand due to setbackes to economic and social development and lacke resources for early warning systems, are more vulnerable to impact of natural disasters(Table 1). Foreign debt also limits the amount of revenue available for public services such as disaster warning systems or response plans. Table 2: compare the impact of natural disasters in developing and Industrialized Countries. To reduce the impact from natural disasters in developing countries, these countries will need economic resources and organizational support to implement any plans or projects that they undertake, knowledge of how to make their populace safer, and early warning of any natural disasters or potential hazards that may result from those natural disasters. Risk transfer provides a safety net for economic loss to property and provides resources to rebuild. 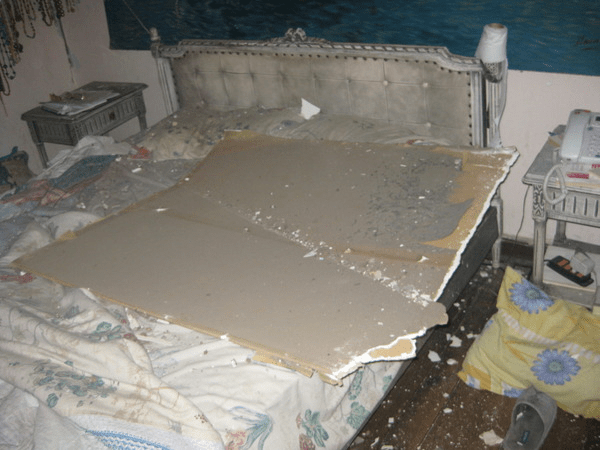 Generally, rebuilding means restoring the damaged property. Risk transfer for natural disasters in the developed world is primarily directed at transferring the risk of damage to private real property to the insurance industry.. In the developing world, with its high concentration of publicly owned infrastructure, an equivalent problem is the vulnerability of infrastructure to the sudden impact of major natural catastrophes. It wasn’t the weather that turned drought into famine in the Congo, Kenya and Sudan. It was armed conflict and weak food distribution networks. 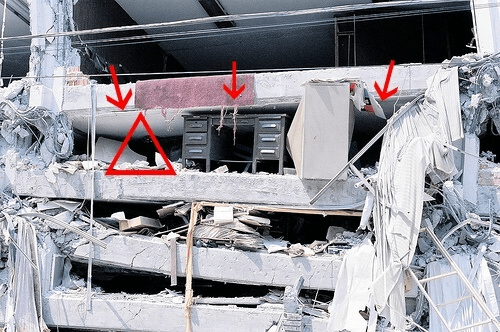 And in China, the government faces accusations that the Sichuan earthquake could only collapse many schools because of corrupt builders and officials. In stark contrast, no child has died in a Californian school during an earthquake since 1933. Similarly, earthquakes in Japan kill fewer people than in developing countries thanks to “better enforcement of building codes, better emergency response, and the generally high level of preparedness,” says the Disaster Risks Hotspots report. Although major natural disasters like earthquake, flood and storm occur in everywhere of the world, but mainly occurred in communities where high levels of poverty, and these events conversion into human and environment catastrophe. Human casualties resulting from crises within countries and internationally show that in crisis, mainly the poorest members of society are suffering the most casualties. According to UN statistics, the chance of killing people in developing and poor countries than rich countries against crisis is 4. Earthquake Haiti another example of such a relationship is confirmed. In Haiti, in fact, more than 200 thousand killed and two million homeless not victims of the earthquake but victims the poverty. although, most people know the apparent reason of killing people is lack of unsafe buildings, but the main reason of that is poverty. While each region in the Periphery or Semi-Periphery-from Sri Lanka to India to Bolivia-may experience unique environmental problems, poverty caused by an unjust international politico-economic regime is a persistent factor that aggravates prevention and recovery efforts. It also ensures that, in each instance, the poor are the most deeply affected by the disaster. To reduce the impact from natural disasters in developing countries, these countries will need economic resources and organizational support to implement any plans or projects that they undertake, knowledge of how to make their populace safer, and early warning of any natural disasters or potential hazards that may result from those natural disasters. Developing country governments including Iran and India should further develop and implement a national adaptation strategy, which is properly mainstreamed across the government’s programmes for eradicating poverty, and adopted by and co-ordinated across all the key ministries. Disaster Risk Reduction needs to be part of long term planning at all levels of government, across all ministries, and particularly at the departmental and municipal level. Disaster preparedness has to be stepped up. Infrastructure development, increasing awareness, training, cooperation between regional countries, funding organizations and international institutions as essential factors to reduce poverty and natural disasters risk. Also Scientific research programs on climate change, its impacts on natural resources, Improvement of the data collection system and analysis, Enhancing of the system of forecasting, modeling and early warning on natural disasters, Building institutional and technical capacity on adaptation issues is recommended. آنچه تا کنون ما از پناه گیری به هنگام وقوع زلزله آموخته ایم در زیر میز و چهار چوب درب بوده است. فکر کنم کمتر کسی از ما با روش “مثلث حیات” آشنایی دارد و نحوه پناه گیری به این روش را می داند. همه ما در مدرسه روش زیر میز و چهار چوب در را یاد گرفته ایم که مساوی با مرگ است! متاسفانه در حال حاضر روش “خميده و پنهان” (Duck And Cover) تنها روش اجرايي پناه گيري به هنگام وقوع زلزله در ايران است. اين روش در مدارس، ادرات و تمامي مانورهاي زلزله آموزش،اجرا و توصيه مي شود؛ و اين درحالي است که در این روش احتمال زنده ماندن بسیار پایین است. در اين بخش به توصيف و تشريح روش “مثلث حيات” پرداخته و نحوه پناه گيري با این روش و با ارائه شکل ها و تصاویر آموزش داده می شود. آقاي داگ کوپ (Doug Copp) رئيس گروه بین المللی تیم نجات آمریکاست (ARTI) American Rescue Team International که مبتکر روش “مثلث حيات” است. اين تيم از مجربترين گروه‌هاي نجات در جهان مي‌باشد. ‌ايشان به درون 895 ساختمان فرو ريخته ناشي از زلزله خزيده است و با گروه‌هاي نجات 60 كشور كار كرده است. همچنين آقاي داگ کوپ به مدت دو سال كارشناس سازمان ملل در زمينه کاهش بلایا (UNX051-UNIENET) بوده است و از سال 1985 به بعد در صحنه بلاياي طبيعي عمده جهان بجز مواردي كه فاجعه آني بوده، شركت داشته است. آقای داگ کوپ در زمینه ایمنی و مقابله با بلایی چون زلزله، سونامی، سیل، آتش سوزی، طوفان، گردباد تخصص دارد و در تعداد زيادي از كشورهاي جهان مانند ترکیه، آرژانتین، مکزیک، روسیه، تایوان، فرانسه و ایتالیا گروه‌هاي نجات را سازماندهي نموده است و عضو گروه نجات بسیاری از اين كشورهاي می باشد. در سال 1996 گروه آنها يك فيلم مستند ساخت كه صحت متدولوژي ارائه شده ايشان يعني “مثلث حيات” را تاييد مي‌كرد. دولت مركزي تركيه و مقامات محلي و دانشگاه شهر استانبول در تهيه و فيلم‌برداري از اين آزمايش علمي و عملي با تيم ARTI همكاري داشتند. آنها در یک کلاس مدرسه (طراحی و ساخته شده برای این آزمایش) 20 مانكن قرار دادند. 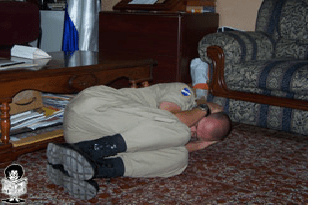 10 مانكن را بصورت “خميده و پنهان” (Duck And Cover) و 10 مانكن ديگر را به روش ابداعي آقاي داگ کوپ تحت نام “مثلث حيات” (Triangle Of Life) جاسازی نمودند. پس از فرو ريختن کلاس در اثر زلزله مصنوعي، آنها به درون آوارها خزيدند و وارد ساختمان‌ها شدند تا نتايج آزمايش را فيلم‌برداري و مستند كنند. در اين فيلم كه فنون زنده ماندن افراد را تحت نظارت مستقيم و شرايط علمي مرتبط با ريزش آوار به صورت يک تمرين نشان مي داد، به روشني نشان داد مانکن هایی که از روش “خميده و پنهان” استفاده كردند، شانس زنده ماندن صفر درصد و آنهائي كه از روش “مثلث حيات” استفاده كردند، 100 درصد بود. اين فيلم در تركيه و كشورهاي اروپائي توسط ميليون‌ها بیننده ديده شد و در ايالات متحده و كانادا و آمريكاي لاتين هم از طريق تلويزيون به نمايش گذاشته شد. به ‌سادگي مي‌توان دريافت، هنگامي‌كه ساختمان‌ها تخريب مي‌شوند وزن سقف كه بر روي اشياء و مبلمان فرود مي ریزد، آنها را درهم مي‌كوبد و فضاي خالي‌اي را در كنار آنها ايجاد مي‌نمايد اين فضا همان چيزي است كه من به آن “مثلث حيات” مي‌گويم. هر اندازه اشياء بزرگتر و محكم‌تر باشند كمتر فشرده مي‌شوند و هر اندازه كمتر فشرده شوند، فضاي خالي كه احتمال زنده ماندن افرادي را كه به آن پناه مي‌برند بيشتر مي‌شود. در اين روش فرد در کنار يکي از وسايل و اشيايي که در کنار اوست پناه مي گيرد. در اين روش هر گونه پنهان شدن در زير ميز، صندلي، تخت و نيز چارچوب در کاملا رد مي شود و منسوخ است و آنرا عامل مرگ حتمي افراد به هنگام بروز زلزله مي داند. هر اندازه وسايل و اشياء محکم و داراي استحکام کافي باشند و اندازه انها بزرگ باشد، مثلث ايجاد شده در کنار آنها بزرگتر و محکم تر است و باعث افزايش ايمني و شانس بیشتر سالم ماندن افراد به هنگام وقوع زلزله و ريزش آوار می باشد. شکل 3-4 نحوه پناه گیری صحیح به روش “مثلث حيات” و روش نادرست “خميده و پنهان” را نشان می دهد. 1- در هنگام بروز زلزله و فرو ريختن ساختمان هر كسي كه از روش “خميده و پنهان” استفاده كند، بدون استثناء و همواره محكوم به مرگ است. افرادي كه زير اشيائي نظير ميزها و اتومبيل‌ها مي‌روند در همانجا له مي‌شوند. شکل 3-5 “مثلث حیات” تشکیل شده در کنار یک اتومبیل را نشان می دهد. داخل اتومبیل ماندن مساوی با مرگ است. 2- سگ‌ها و گربه‌ها و بچه‌ها همگي آنها اغلب بصورت طبيعي در وضعيت جنيني كه در رحم قرار دارند، خم مي‌شوند و شما هم بايد همين طور عمل كنيد. اين غريزه طبيعي ايمني و اصل بقاء است. شما مي‌توانيد با همين شيوه در فضاي خالي كوچكتري زنده بمانيد. پس در زمان بروز زلزله سريع خود را كنار اشياء بزرگ، مانند كاناپه بزرگ و يا اجسام محكمي كه در مقابل ضربه كمتر فشرده مي‌شوند و فضاي خالي در مجاور خود باقي مي‌گذارند، قرار دهيد (شکل 3-6). 3- ساختمان‌هاي چوبي از ايمن‌ترين نوع ساختمان‌ها محسوب مي‌شوند كه مي‌توانيد در هنگام وقوع زلزله در داخل آنها باشيد، دليل آن ساده است زيرا چوب انعطاف پذیر می باشد و با نيروي زلزله به راحتي حركت مي‌كند. اگر ساختمان چوبي فرو ريزد فضاهاي خالي بزرگي ايجاد مي‌شود. همچنين ساختمان‌هاي چوبي داراي وزن متمركز شده و خرد كنندگي كمتري هستند. ساختمان‌هاي آجري مي‌توانند در حد قطعات آجر متلاشي شوند و آجرها منجر به بروز صدمات زيادي مي‌شوند، البته اجساد له شده ناشي از فرو ريختن آنها از صدمات حاصل از فرو ريختن قطعات بتني بزرگ، كمتر مي‌باشد. در شکل 3-7 راست، خرابی یک خانه چوبی باحفظ اسکلت آن را می توان مشاهده کرد ولی در شکل چپ تخریب کامل ساختمان های بتنی به وضوح دیده می شود. خانه های چوبی به دلیل سبکی مصالح و انعطاف پذیری مصالح، خرابی کمتر و در نتیجه آسیب کمتری نسبت به ساختمان های بتنی و سنگی دارند که سنگین تر و غیر قابل انعطاف می باشند. 4- اگر زلزله در شب و زماني كه شما در رختخواب خود هستيد اتفاق بيفتد، كافي است از روي تخت به پايين بغلتيد، يك فضاي ايمن و مناسب در اطراف تخت وجود دارد. هتل‌ها مي‌توانند نرخ زنده‌ماندن ساكنان خود را در هنگام وقوع زلزله، با نصب تابلوي راهنما در پشت درب اتاق‌ها و اطلاع‌رساني به ساكنان مبني بر اينكه “در هنگام وقوع زلزله روي زمين كنار تختخواب دراز بكشيد” افزايش دهند (شکل 3-8). 5- اگر شما هنگام وقوع زلزله در حال تماشاي تلويزيون هستيد و فرار از در يا پنجره برايتان بسادگي امكان‌پذير نيست، در وضعيت جنيني در كنار كاناپه يا صندلي بزرگ خم شويد (شکل 3). 6- هر كسي كه در زمان وقوع زلزله در زير درب قرار گيرد، محكوم به مرگ است. زيرا هنگامي كه زير درب قرار دارد، چهارچوب اطراف درب به سمت جلو و عقب مي افتد، و زیر مصالح ساختماني بالاي چهار چوب درب له خواهد شد و اگر ستون‌ها به طرفين بيفتند(چپ و راست) در اين حالت توسط آنها به دو نيم خواهد شد لذا در هر دو صورت جان خود را از دست خواهد داد (شکل 3-9). 7- هرگز در هنگام وقوع زلزله بر روي پله ها نرويد، زيرا پله‌ها داراي گشتاور فركانسي متفاوتي هستند و لذا مجزا از تنه اصلي ساختمان نوسان مي‌كنند. به عبارتي پله‌ها و بقيه ساختمان با همديگر برخورد مي‌كنند تا اينكه شكست سازه‌اي در پله رخ دهد و كساني كه روي پله هستند قبل از اينكه پله خراب شود توسط گام‌هاي پله گرفتار شده و بصورت وحشتناكي قطع عضو خواهند شد. در هنگام زلزله حتي اگر ساختمان فرو نريزد باز هم از پله‌ها دور بمانيد، زيرا پله‌ها از مناطقي هستند كه احتمال تخريب بيشتري دارند. حتي اگر پله‌ها توسط زلزله فرو نريزد، ممكن است در اثر وزن ازدحام زياد افرادي كه فريادكشان از روي آن در حال فرار هستند فرو بريزد. پله‌ها بايد پس از وقوع زلزله هر چند كه ساختمان آسيب نديده باشد از نظر ايمني مورد آزمايش قرار گيرند. شکل های (3-10). 8- به ديوارهاي محيطي ساختمان نزديك شويد و يا در صورت امكان به بيرون از آنها برويد. هرچه داخل‌تر و دور‌تر از ديوارهاي محيطي ساختمان باشيد احتمال اينكه راه گريز شما مسدود شود بيشتر خواهد بود. 9- كساني كه در هنگام وقوع زلزله در خيابان‌ها داخل خودروي خويش مي‌مانند وقتي كه خيابان طبقه فوقاني روي آنها خراب مي‌شود (در اتوبان‌هاي دو طبقه)، جان خود را از دست مي‌دهند. اين دقيقآ همان چيزي است كه در آزادراه نيميتز (Nimitz Freeway) رخ داد و قربانيان زلزله سانفرانسيسكو همگي در داخل خودروي خود به هنگام زلزله باقي ماندند و همگي كشته شدند. آنها مي توانستند زنده بمانند اگر از خودرو خارج شده و در كنار آن نشسته و يا دراز كشيده بودند.كليه خودروهاي له شده بجز خودروهائي كه ستون‌هاي پل مستقيمآ روي آنها سقوط كرده بود، داراي فضاي خالي‌اي به ارتفاع 90 سانتي متر در اطراف خود بودند (شکل های 3-11 و 3-12). 10 – از خزيدن در داخل خرابه‌هاي دفاتر روزنامه‌ها و يا اداراتي كه كاغذهاي انباشته زيادي در آنها وجود داشته است، دريافتم كه كاغذ داراي خاصيت ارتجاعي بوده و چندان فشرده نمي‌شوند، لذا فضاهاي خالي زيادي در اطراف بسته‌هاي كاغذ بوجود مي‌آيد كه مي‌تواند در زمان زلزله مورد استفاده قرار گيرد (شکل 3-13). نویسنده این وبلاگ سعدی قادری هستم. در حال حاضر دانشجوی دکتری عمران در پژوهشگاه مهندسی بحران و پدافند غیر عامل اصفهان می باشم. با توجه به بلاخیز بودن کشور عزیزمان ایران و به منظور آشنایی بیشتر دانشجویان، علاقمندان و عموم مردم با بلایای طبیعی، کاهش ریسک بلایا و مدیریت بحران، این وبلاگ تلاش می کند اطلاعات، دانش و تجربه های مربوط به شناخت بلایای طبیعی و مدیریت بحران در جهان و ایران را ارائه نماید. امید که گامی در جهت داشتن جامعه ای ایمن و ایرانی آباد باشد. This entry was posted in Uncategorized and tagged American Rescue Team, American Rescue team International, Chief Norman NYFD, Climate change, dead planet, disaster, doug copp, doug copp. Doug Copp. ARTI, duck and cover, earthquake, farsi, Iran, leslie linthicum, occupy Wall Street, private schools, quake alarm, safety, triangle of life. Bookmark the permalink. The 9 page general safety program (see ‘The Triangle of Life goes viral, in Russia’Blog) or at least the Triangle of Life (page 4) needs to be distributed, in Greek. Can you do this?